Canoeing fun for casual water sports. A canoe is a small narrow shaped boat that does not have a motor. Most canoes are propelled by water current or by oar paddling; however, sails, electric motors, or small gas motors can be attached. Canoes are constructed of wood, fiberglass, aluminum, Kevlar, or Royalex and comfortably seat up to two people. Canoes are used for recreational purposes such as fishing, hunting, and leisure water trips in rivers, streams and lakes. 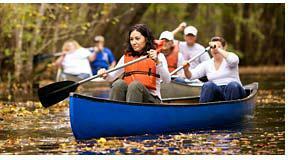 Canoeing	is a sport for all ages and is available from coast to coast in the USA and around the world. Another small similarly shaped boat is called a kayak. Kayaks are propelled by water current or by oar paddling. 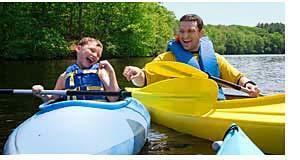 There are several types of kayaks and each one is constructed with specific purposes in mind. Recreational kayaks, made of wood, plastic, or fiberglass are designed with a larger cockpit and a wider beam for stability. You can use a kayak for fishing, photography, or a leisurely paddle down river or across the lake. Recreational kayaks are typically less than 12 feet in length, accommodate one or two persons, and average between in $300 to $600 in price. Another type of kayak is the whitewater kayak. Made from rotomoulded high-performance high-impact composites such as Kevlar and polyethylene, these kayaks can take a beating and keep on going. There are four main types of hard shell whitewater kayaks, which include freestyle, free running, river running, and kayak for use on white water creeks. You use a freestyle kayak to perform water tricks on rivers and free running kayaks are popular for river paddlers across all river conditions. River running kayaks are used to navigate diverse rivers, surf, and large waves and the creek kayak is best for the steeper, more technical, and challenging whitewater situations. Whitewater kayaks typically measure between 5’ to 12’ and range from $600 to $2,000 in price. Canoes and kayaks as well as some of the smaller aluminum boats are considered car toppers because they can be transported on top of cars or in pickup trucks to and from various waterways. Canoe and kayak rental companies are situated across the US near rivers, lakes, state parks, and campgrounds offering the non-boat owner an opportunity to experience a day of fun on the water. Check out the latest car top boats and canoes for fishing and canoeing in your area, by selecting a state below. Car topper boats and conoes by state. Whether you purchase or rent a canoe, kayak, or other small boat that can fit on top of your car, you will have a wonderful time on the water with easy transport of your vessel. Buy or rent a canoe or car topper.